Where does Crescent Creamery milk come from? Crescent Creamery milk comes from local and regional family-farms in western New England. How many servings of dairy foods should I eat every day? Dairy's nutrients are an essential part of promoting bone health and overall health. The Dietary Guidelines for Americans recommends 3 servings of low fat or nonfat milk and/or other dairy products every day as part of a healthy diet. All fluid milk products and many foods made from milk are considered part of this food group. (Foods made from milk that retain their calcium content are part of the group.) Most milk group choices should be fat-free or low-fat. For how long after the "sell by" date can I still use milk? Properly cared for, milk stays fresh for 5 to 7 days beyond the "sell by" date. The biggest factor . . . keep it cold. Milk should be stored between 34° and 38° at all times. Why and how is milk pasteurized? Milk is pasteurized for safety. Pasteurization kills potentially harmful bacteria without affecting the taste or nutritional value of milk. During the standard pasteurization process, milk is heated to a temperature of at least 161 degrees Fahrenheit for a minimum of 15 seconds and then cooled rapidly. Do dairy foods contain antibiotics? No. 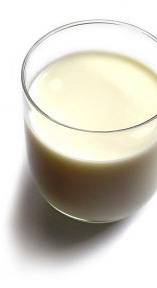 Several safety measures are taken to ensure that antibiotics do not enter the milk supply. Any cow that is being treated with antibiotics is taken from the milking herd, treated and not returned to the herd until her milk tests completely free of antibiotics. Every tank load of milk is tested for antibiotics. If a tanker tests positive even for trace amounts of antibiotics, all milk is disposed of immediately. What is rbST hormone and is it used in dairy production? First, it is worth noting that all milk, including human breast milk, contains natural hormones. RbST (recombinant bovine somatotropin) is an artificial hormone – approved by the FDA – used by some dairy farmers to increase milk production. However, many consumers have expressed continuing concerns and, responding to consumer interest, many dairies have chosen not to use rbST. All Crescent Creamery brand milk is free of rbST growth hormones. Got more questions about milk? We recommend that you visit the National Dairy Council website or any of the other milk and dairy links.